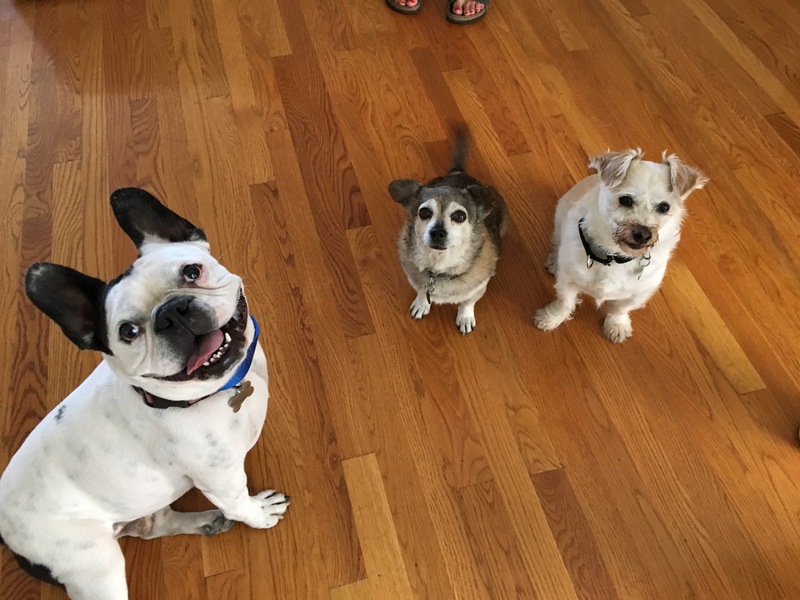 Carl (left) is a four-year-old French / English Bulldog mix who moved into his guardian’s parent’s home in Hollywood, home to eight-year-old Terrier mix Bentley and ten-year-old Chihuahua mix Shelby. The dog’s guardians contacted me to set up a dog obedience session to address Carl and Bentley’s marking in the house, Bentley’s growling and all three dog’s habit of pulling on the leash. Living up in the Hollywood Hills, the dogs came out to greet me as I pulled up for the session with Carl jumping up on the side of the car and Bentley and Shelby barking an alarm. When I got out of the car, Carl tried to jump up on me a few times which can be a dog’s way of claiming a human. I immediately disagreed and after a few rebukes, Carl stopped trying to jump up. Because it was such a beautiful day, we headed out to the back deck to sit down and discuss how I could help. It only took a few minutes for the humans and dogs to all tell and show me the issues that needed to be addressed. While there were multiple things going on that had contributed to these dogs acting the way they were, a lack of rules and structure was at the top of the list. I suggested some rules and boundaries that will help the dogs start to see and identify the humans as being authority figures. This is a crucial first step necessary to modify or change dog behavior. I also shared a philosophy that I have developed that helps humans add a tiny bit of structure to rewarding their dogs. I like to call this petting with a purpose. Many people mistakenly think that they can get their dog to adopt better behaviors by petting them profusely. Petting a dog can certainly have a positive impact, but you need to provide the attention and affection at the appropriate times. If the guardians can start petting with a purpose, this sort of positive dog training will go a long ways towards helping the dogs adopt desired behaviors. Of course there are times where you need to be able to tell a dog no as well. The guardians have been using the word “no” but because it is so commonly used, I find many dogs ignore it. I spent the next couple of minutes going over some nonverbal communication cues that the guardians can use anytime a dog breaks a rule or does something they do not approve of. Because I derived these cues form how dogs communicate with one another, all three responded immediately. Right as we were wrapping up the discussion on these nonverbal communication cues, one of the guardians made herself a sandwich and was immediately surrounded by all three dogs. I spent the next few minutes explaining how the guardian can utilize the new communication cues to ask the dogs to keep a respectable distance from her as she eats. By asking the dogs to respect a reasonable amount of distance from the humans when they are eating or engaging in any other behavior that they want to do on their own, they will help the dogs understand that they are expected to show respect for their personal space. Next we addressed the dog’s habit of pulling on the leash and being reactive to people and dogs that were encountered on walks. To give the humans more control, I fitted the dogs up with Martingale collars and showed the guardians how to apply the special twist of the leash to give them more control. I shared the rules that I incorporate for a structure and walk and how to correct the dogs when they got out of line. After addressing those issues, we all headed out for a structured walk together. When we were returning from the walk, the guardians were marveling at how much better behaved the dogs were. However, they said they wished that we had encountered another dog on the walk so that I could see the dog’s behavior. Fortunately one of the neighbors was home and we were able to get her to bring her dogs outside so that I could demonstrate how to facilitate a calm greeting and interaction. As you can see in the above video, when I attempted to approach the other dogs with Bentley and Carl together, it was just too much. Anytime that you have multiple dogs and a situation gets out of hand, reducing the number of dogs so that you can work with fewer or one dog if needed is always a good strategy. It would also be a good idea to schedule these meetings after Carl or Bentley has had a sufficient amount of exercise. Removing excess energy puts the dog in a better position to succeed. When we returned to the dog’s home, I wanted to show the guardians how they could control the door answering ritual. Many dogs rush the door and bark excitedly because they think they are in charge of security. Because security for the pack is generally handled by the authority figure, having the humans take over door answering duties will go a long ways towards helping these dogs adopt a follower’s mindset. The dogs responded pretty well despite the fact that the open floor plan gave them multiple paths to the door. This isn’t as challenging for an experienced dog trainer / dog behaviorist, but for people without a lot of experience, sometimes too much access is too hard to defend. If the dogs prove to be too unruly or uncooperative when the practicing this exercise in the future, the guardians can use some of the furniture to change the environment slightly. Moving chairs or other furniture so that it creates a little bit more of a bracketed area will make it easier for them to control access to the door. As the dogs get better at the exercise, the guardians can gradually remove the furniture one piece at a time. But the important thing is that the dog’s guardians can answer the door themselves when I’m not present. We reset the exercise so that the guardian could practice answering the door while I was there observing only. This allowed me to coach her along and provide tips and suggestions. The dogs responded very well to the guardian. However she could improve things by having a little bit more deliberateness or crispness to her steps (not slowing down or stopping until the dog turns, backs up or moves away). She will also need to make sure that she keeps her hips and shoulders pointing at whatever dog she is moving away from the door at that time. If practicing with all three dogs simultaneously is the problem, practicing it with each dog individually until they develop the proper response is another great suggestion. Once each dog knows what is expected, then they can bring the other dogs in one at a time and build up to the trio. I recommended that the members of the family call or text one another when they are on their way home and practice knocking on the door as if they are a guest. This allows us to go through the ritual without the pressure of an actual guest waiting on the other side of the door. By the end of the session the dogs were noticeably calmer. Carl could walk next to Bentley without Bentley bearing his teeth, snarling or nipping at him. In fact, Carl and Bentley took turns sniffing each other’s rears and crotches; great and proper social interactions for dogs. This was behavior and interactions that never happened before the session without some snipping, growling or other aggressive posturing. By consistently enforcing the new rules with good timing, petting the dogs with a purpose and practicing the various exercises we introduced in the session, the humans will be able to communicate to their dogs exactly what behaviors they do and do not want from them. With a little practice, their social skills will improve to the point where the dogs are auto correcting.